If there’s one thing that the Parisians love, it’s their dogs. In fact, there’s a statistic bandied around that there are more chiens in the city than children. Whether that’s true or not, we don’t know, but it’s certainly rare to walk down the street without seeing at least a couple of pampered pooches. Indeed, this being Paris, everyone’s dogs are of course immaculately turned out. Dog grooming parlours (toilettage pour chien), the canine equivalent of beauty salons, are everywhere. And that’s not mention the pet stores (animaleries), selling every doggy accessory you could possibly need – and a fair few that you probably didn’t. So, for those of you thinking of bringing your four-legged friends to Paris, you’ll be in good company. However, whilst dogs here often are allowed to accompany their owners to a surprisingly wide range of places, including some shops, on public transport and even in many restaurants, there are a few rules of which to be aware. Perhaps the most surprising, given the relaxed attitude to dogs in many places, is that dogs are actually banned in many parks and green spaces. As a result, be sure to check the notices at the gate (look out for “Pas de chien”), as entering a prohibited place with your furry friend could result in a stern ticking off. 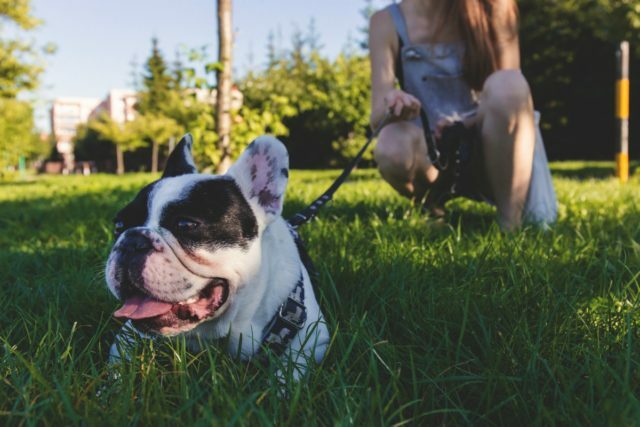 Among those that do allow dogs are the Jardin des Tuileries and Jardin du Luxembourg, where they have dedicated areas, but they’ll still need to be on lead. For a proper run, you’ll need to travel to one of the bigger parks on the edge of the city, such as the Bois de Vincennes, where strictly-speaking they should still be on the leash but the rules are a little more relaxed. Which brings us on nicely to the rules for transport. Whilst dogs are allowed on Metros, buses and trains, there are some restrictions that apply. For the Metro and buses, the rule goes that only small dogs are allowed – though you’ll often see larger dogs on the Metro at least. In any event, they need to be on a lead and a muzzle won’t go amiss either. Larger dogs are allowed on the RER, but they have to have a special dog ticket, be on a lead and wearing a muzzle. Historically, shops and restaurants in Paris have been very relaxed about dogs – but they have got a bit stricter in recent years. To check whether a dog is allowed, look out again for the signs saying: “Pas de chien.” Occasionally, though, the rules will be bent for regular customers. The last thing to mention is that, when your dog does his or her business, be sure to pick up after them. While the Paris streets are rather renowned for their poop, as Stephen Clarke memorably described in his books about France, there is a hefty fine for anyone getting caught.